Producers work like coaches with their production teams to develop the best content possible. Its crucial that we establish our broadcast programs as public forums, independent from school administration and free from prior review. This means that students must make all content decisions, and run the news organization as a team of professional journalists. In order to do this, we need to organize our staffs to create an efficient workflow and oversee journalistic challenges–a decision that can affect the quality of your program, your daily work environment, and, potentially, legal and ethical conflicts. A traditional newsroom has responsibilities divided into specialties: news, sports, features. Additional staff might also be needed for social media, web stories and content, and advertising. I’ve had many variations of the staff org chart over the past 15 years. Lately, I’ve organized our staff like this. Every program needs to have an editorial board to make important decisions about content, ethical concerns and overall direction for the program. While we often have all-hands meetings and discussions, the editorial board are experienced staffers who have a good vision for the program and a solid grasp of journalistic purpose and ethics. And sometimes its just best to have discreet conversations with a small group. For our show, the editorial board is comprised of producers, who act much like page editors on newspapers, and oversee content produced in those areas. 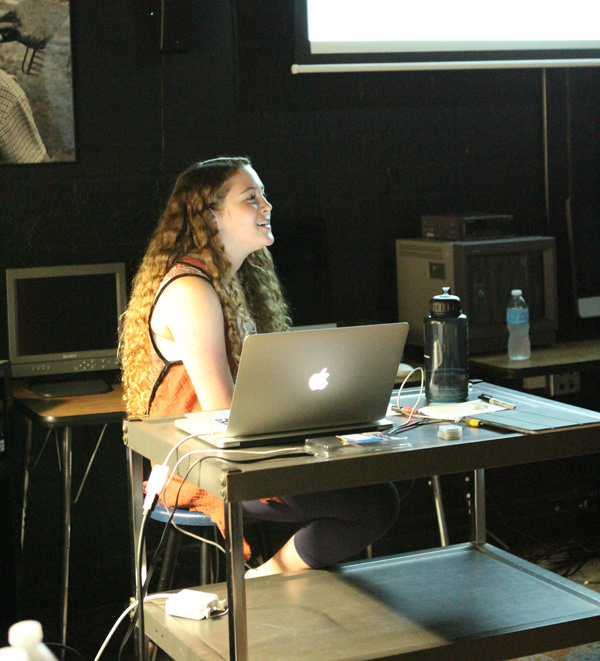 Our Online Producer, Miriam Sachs, presents examples and best practices to the staff during a training day. Similar to the Editor in Chief of a newspaper, the News Director is ultimately responsible for the show, including content, assigning stories, acting as the spokesperson for the show, and making final decisions in all matters. We have two co-news directors. Our show has two producers to oversee each of the three major content areas: News, Sports, Features. They act as coaches for the reporting teams, provide guidance and ensure quality stories. We have two producers for each content area so that the work can be shared, and we avoid problems should someone be absent. These are all “working” producers, which means they are also reporters/photographers on news stories in addition to their producing duties. News packages are produced by a reporter and photographer team. 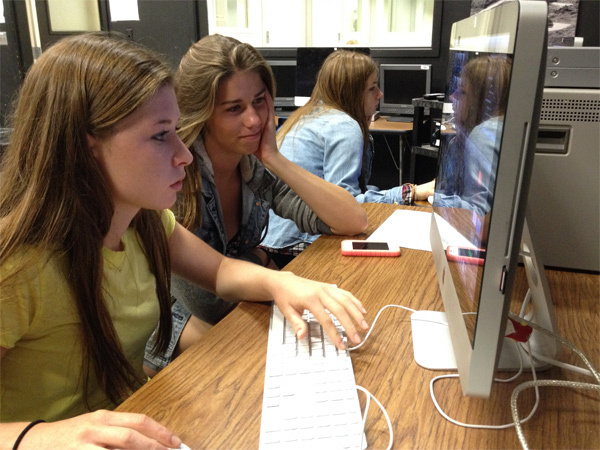 Students work in pairs for each newspackage. The reporter is in charge of research, writing, interviewing, and the overall story effectiveness. The photographer shoots and edits the video, records/mixes audio, and creates graphics. Even though there is a division of labor here, we get the best results when a team works together seamlessly. 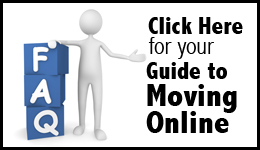 Depending on your staff size, output and needs, you may consider other roles as well. We have an Online Producer who oversees all content on our website (headlines, excerpts, video embeds, blogs, etc.) and a Social Media Producer who oversees, well, all of our social media accounts (content, style, grammar, etc.). This year we have a Special Assignments Producer, and in the past we’ve had a Historian. If your staff is large enough, you might even have staff writers whose job it is to write show scripts, a technical crew responsible for equipment or graphics, or a dedicated sports crew. Although this is a top-down org chart, the producers also act as reporters, and coach their peers to do well. Because we’re a public forum publication, students have to be free to run the show by themselves. 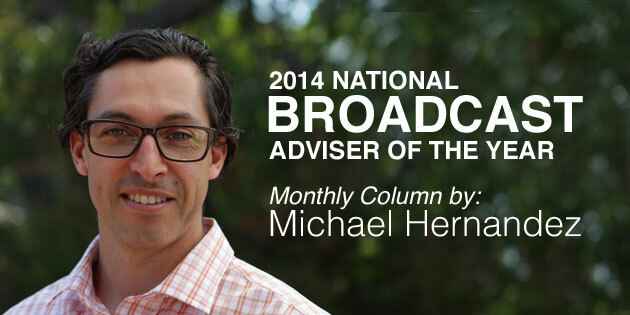 The advisor should only have a supporting role, which is why producers are so important–they are in the trenches making decisions about how to best report the news. They need to be mature and have a clear sense of journalistic integrity and purpose. Major content and ethical decisions are made by the Editorial Board who meet outside of class once a week or as needed. The news directors are ultimately responsible for the show. In future articles, I’ll discuss how to find the right students for these positions and develop them into effective leaders. I’ll also talk about how to grade students when they have very different responsibilities. 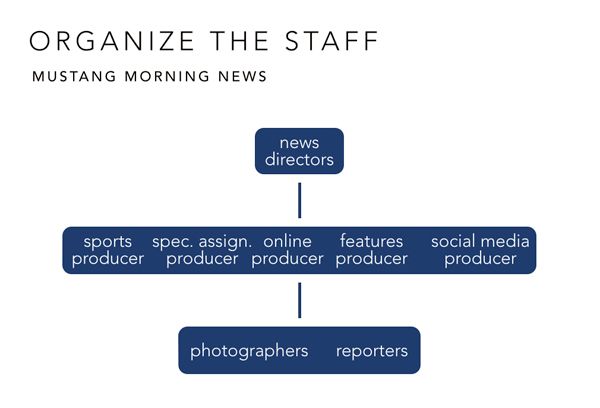 How do you organize your broadcast staff? What are the benefits to running your show that way? Please leave your ideas in the comments below.